is one of the few European cities that has a long history combined with a continuous and important role throughout the aeons. The recorded history of Thessaloniki begins around 316/315 BC., when king of Macedonia, Kassandros (son-in-law of Alexander the Great) united the inhabitants of 26 villages and towns in a new city, Thessaloniki (named after his wife). The new city of Thessaloniki had an outstanding geographical and strategic position: Thessaloniki was located at the end of the great valley of Axios river. This valley is connected with the valley of the Moravas river and therefore with the Danube and Central Europe. At the South-West of Thessaloniki lied the Aegean Sea, the main route used throughout the centuries towards the Greek and Ionian coasts, as well as to the major commercial cities of the Southern Mediterranean. These geopolitical conditions, combined with the existence of a rich inland, contributed to the rapid and continuous development of the city throughout the Macedonian, Roman, Byzantine and Ottoman Empires' era and modern Greece since 1912. Today Thessaloniki is a modern, metropolitan city with a population of over one million inhabitants. Thessaloniki is an active center of commerce and culture not only of Greece but also of the Balkan peninsula. The local industry has been continuously developing, while trade, traditionally the strong point of the city, is prospering. Recently Thessaloniki has become the seat of CEDEFOP (European Centre for the Development of Vocational Training) and the Black Sea Trade and Development Bank headquarters. Culturally Thessaloniki prospers offering numerous museums within the city or a few hours drive away and the extremely successful International Film Festival of Thessaloniki, which is hosted by the Port since 2001. In the Port area you will also find Thessaloniki's Cinema Museum . Recently, an impressive Concert Hall has been added and the National Theater of Northern Greece together with the renovated theaters of the city continue the cultural dominance of Thessaloniki in the area. Thessaloniki is well known for its active scientific community with three Universities, the Aristotle University of Thessaloniki , the University of Macedonia and the Alexandrian Technological Institute . The city is also known for its variety in entertainment ("Ladadika", " Milos ", "Vilka") etc. One of the thessaloniki important advantage is its direct access to the beaches of Chalkidiki and Pieria during the summer, and to the outstanding winter vacation centers, "Seli", " Kaimaktsalan ", "Pelion" etc. Copyright 2000 - 2004 travelthessaloniki.com. All rights reserved. 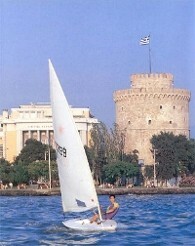 Travel thessaloniki .com is a part of Travelinfo.gr.